The Virginia legislature adjourned last week after a tumultuous session in which photos from the governor's medical school yearbook page showing a man in blackface were published by a conservative website. And that not only rocked the Virginia statehouse, it led to revelations about other white politicians appearing in blackface and a national conversation about why white people started wearing blackface to begin with. But that's called attention to another aspect of the story, one that will be on display on Fat Tuesday in New Orleans this coming week - and a tradition that goes back 110 years. Members of the Zulu Social Aid and Pleasure Club, who are for the most part African-Americans, blacken their faces for their annual Mardi Gras parade. 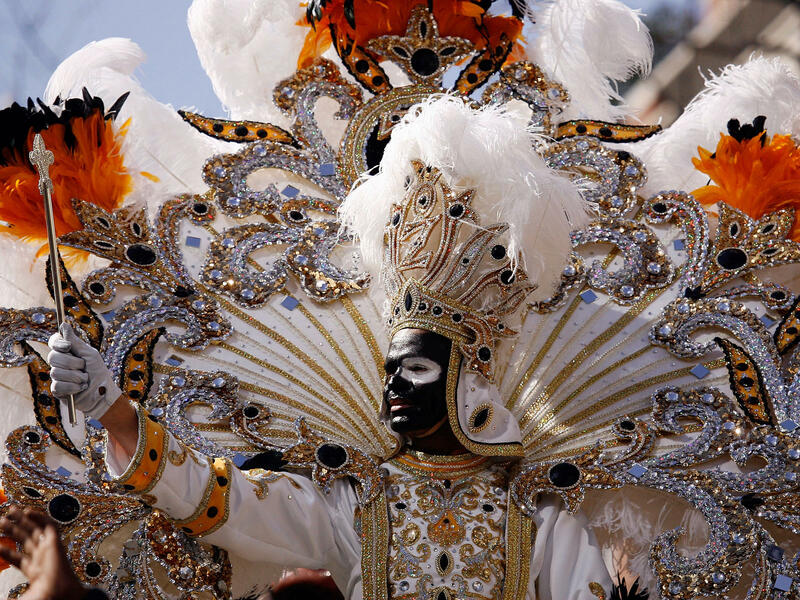 They also put on costumes featuring grass skirts, feathers and bone necklaces. But it's the blackened faces that have drawn the most scrutiny. We called historian Shantrelle Lewis to help us understand the history of the Zulu Krewe, or club, in New Orleans. She's studied the use of blackface in different parts of the world, and she's with us now from member station WHYY in Philadelphia. Shantrelle Lewis, thank you so much for joining us. SHANTRELLE LEWIS: Thank you, Michel. MARTIN: So you are from New Orleans. How did the Zulu Social Aid and Pleasure Club get started in 1909 to begin with? LEWIS: The Zulu club was actually founded in response to the racism that was present in Mardi Gras, where black people were not allowed to participate in the historically white krewes, or Mardi Gras organizations, such as Rex and Comus and Bacchus. So the Zulus decided to create this parade. And so it was a way to combat some of the racism and segregation that was taking place in Mardi Gras. MARTIN: So why the blackface? And was this - has anybody ever called attention to this before? Has anybody ever objected? LEWIS: Oh, yeah - plenty of people. I mean, there's been times throughout history the NAACP said it was problematic. So many black people - and even during the Black Power movement, they were also receiving a lot of flak for the blackface. But if you're looking at the Zulu club within a tradition of masquerading and masking, painting one's face is a part of Carnival - or it's a part of a masquerade. And the Zulus will say that they could not afford masks. It was cheaper and it was accessible for them to actually paint their faces black. MARTIN: OK. Can I just ask you, though - what about, like, the big white lips, that whole thing? Has anybody ever engaged with them on that question? Like, why that? LEWIS: I mean, it's a caricature. It's Mardi Gras, so everything is exaggerated. If you look at even krewes that are traditionally white, they also have these caricatures of white people and European features. And so it's an exaggeration. And while it's connected to minstrelsy, historically, I think that it was more rooted in this idea of a masquerade - a mask. MARTIN: All right. So earlier this month, the Zulu club released a statement about the use of blackface, calling it a traditional cultural expression that, quote, "has always been about celebrating African and African-American culture." But there was a protest in front of the Zulu clubhouse a few weeks ago from Take 'Em Down NOLA, this is this group that's been very vocal in the debate over the removal of Confederate monuments. And now they're turning their attention to the use of blackface in the Zulu parade. MARTIN: I'm not going to ask you speak for the entire city. But I am wondering, though, what are you hearing from, like, relatives and friends in New Orleans? Like, how do they feel about this back-and-forth about it? LEWIS: I mean, people are just really dismissive, to be honest with you. I think that New Orleans understands New Orleans' traditions. And the city has been very insular - right? A lot of our traditions have just existed without the participation and the scrutiny of people outside of New Orleans. And so I think that for the average black person in New Orleans, including those members of my family, they just simply do not connect the blackface in Zulu with minstrelsy or making a mockery of black people. And they most certainly are not looking at it as an offensive tradition. MARTIN: That's Shantrelle P. Lewis. She is an historian and curator and lover of her hometown of New Orleans. MARTIN: And we reached her in Philadelphia. Shantrelle P. Lewis, thank you so much for talking to us. LEWIS: Thank you, Michel. And (speaking French) laissez les bons temps rouler. Transcript provided by NPR, Copyright NPR.